Is there an echo in here? Why, yes, there is! For this week’s Work in Progress is an Echo Flower Shawl, which I am knitting in Gloaming from The Yarn Yard. 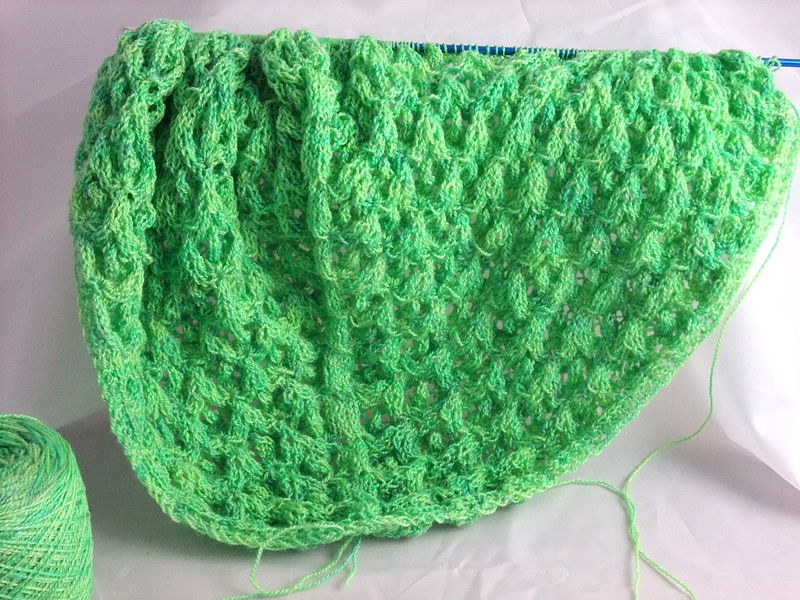 This project is the third or fourth cast on that I have made with this ball of yarn and I think that at last I may have found the right pattern and yarn combination. The shawl version calls for 13 repeats – and 880 yards. I have 874 yards. It’s tight. I tried spreadsheeting but it is very difficult to calculate for the nupps. Overall, I believe that I shall cut it short at 12 repeats of the body chart and just be certain of avoiding disaster. I have completed 11 repeats so far. Not looking forward to the nupping. Feel free to cheerÂ me on! The remainder of this week will be horribly busy. I need to tame the craft room and attempt to unearth some items for the Craft Fair on Sunday. Mr L starts his hols on Friday and we shall be in DIY mode once more, with floor boards raised and paint cans open. You will realise that his plans and my requirements do not entirely mesh. Blog service will resume at some point. There may well be FOs to share — but perhaps not this particular Friday. Previous Post Oh what a circus! Oh what a show! Beautiful shawl and I love the color. Good luck with the craft room. I cleaned out mine two weeks ago and I can finally breathe again in there. beautiful color of green. Ok…pleading virgin ignorance…what is a nupp? A Nupp is a peculiar form of knitter’s torture. 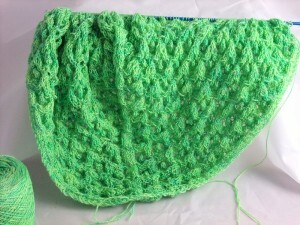 Basically you [K1,YO] several times into the same stitch – making an odd multiple of stitches (5,7,9 or more, if you wish) from the one stitch. On the return journey you purl all those loops together, to return to the one stitch again. This can be challenging if you don’t make the loops loose enough in the first place. Estonians must be inordinately fond of bobbles. A well-known pattern exhibiting use of nupps would be Evelyn Clarke’s Swallowtail Shawl. I am a survivor of two Swallowtail projects. Sadly, nobody awarded me a badge for this.